On arrival you will be received and transferred to your hotel. Check in at the hotel, Remainder of the day at leisure. overnight at the hotel. After breakfast, visit: Tsar\'s winter Palace, Nevsky Prospekt, Peter and Paul fortess, St. Isaac\'s Cathedral, the Russian museum and the statue of Peter the Great. evening visit a theatre for a Russian folklore show. overnight stay at the hotel. Breakfast in the hotel. 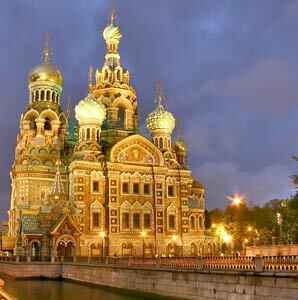 Visit Hermitage Museum one of the world\'s largest and most valuable Art collections. Rest of the day free. Night train to Moscow. Early morning arrival transfer to your hotel. Enjoy breakfast and relax before a sightseeing tour shows in Red Square, St. Basil\'s domed Cathedral and the Kremlin walls. overnight stay in Moscow. Breakfast in the hotel. Take a trip to nearby Zagorsk - a centre od Russian art and architecture, as well as once being the religious capital of Russia. overnight stay in the hotel. Day to relax or you can explore the city on your own. You can visit Treasue chamber of Tsar. Evening exciting Moscow State Circus. overnight stay in the hotel. After breakfast transfer to the airport for your return flight home.